Collegewood Elementary students cheer on their robot at Robot Expo. The Walnut students were real fireballs and the Pomona kids weren’t far behind in the Robot Expo at the Fairplex on Monday morning. 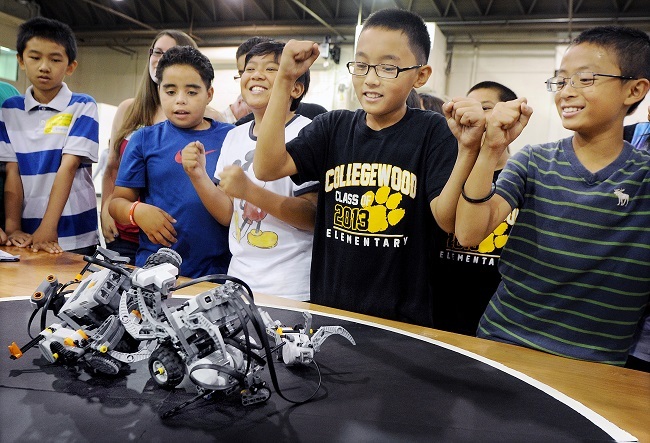 The fun competition is part of Cal Poly Pomona’s School Robotics Initiative. In fact, Team Fireball from Suzanne Middle School won the gold medal in the Gate Crasher contest with an amazing time of 6.967. In the close competition, students have to program their robots to pass through a gate in 7 seconds. Easier said then done, when the students have to calculate the circumference of their robot’s wheels, estimate the gear ratio they should use and program the power running through the little electric motors. But the Fireball team seemed to have mastered the engineering challenge. Team captain Augustus Rodriguez worked with classmates Adel Nasir and Abdul Rahman Ali to build the winning robot. The little machines force the students to focus on science and math. “The students have to apply their math and science skills to build their robots, which motivates them to do better in school,” explained Nicole Forrest Boggs, director of development for the College of Education at Cal Poly Pomona. Since 2006, the university has worked with elementary and middle school students in the two districts to develop an innovative robotics curriculum. This entry was posted in Cal Poly Pomona and tagged walnut, Walnut Valley Unified by Richard Irwin. Bookmark the permalink.